TrainerRoad is an app (for your smart phone or computer) which brings indoor training with power to the masses. And those with excess masses. Whilst you can use it with a power meter, or have it control your ‘smart’ indoor trainer, the appeal for me (and the rest of the power-less cycling population) is that TrainerRoad can take data from your speed and cadence sensor and, using what it knows to be the power curve on your (non-smart) indoor trainer, estimate your power output. This power number then appears on the screen as you pedal (along with other metrics: cadence, heart rate etc) and is recorded as you complete the training session. TrainerRoad contains a number of programmes and individual training sessions, allowing you to use all of this power data to create (and follow) a training schedule that will improve your cycling fitness and performance. 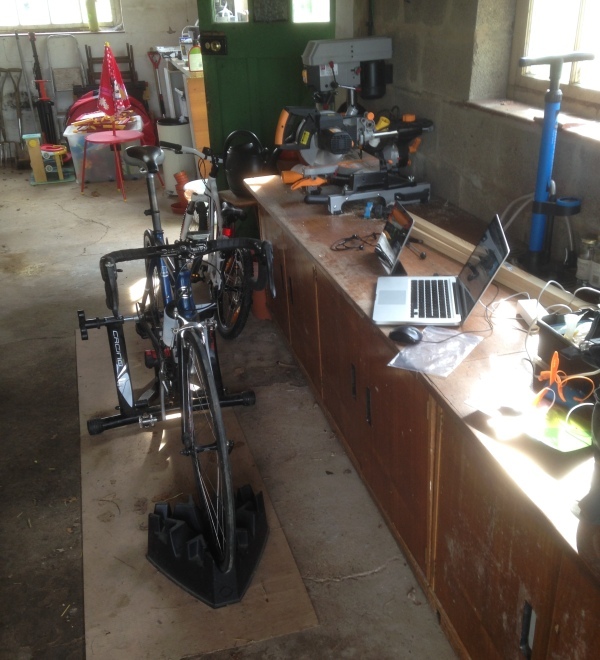 At the end of December last year, a chance visit by the electrician to fit lights in the garage led to the discovery that it wasn’t the absolute worst place to set up my indoor trainer. And I then rode 35 days in a row (much of it in said garage on said trainer). A Sunday afternoon spent tidying the garage recently (I think I was trying to avoid the mewling new infant that has just joined the peloton) turned into the replacement of the back tire on my trusty (but ill-fitting) Dawes road bike. The Dawes always used to my indoor trainer bike of choice, with the Trek Domane saved for best (‘best’ being abuse on the potholed lanes of Derbyshire). ‘Dawesy’ was deprived of its role when the back tyre developed a strange bulge after changing an inner tube and I never quite got round to replacing it (I now have, with this extremely robust tyre). I digress. The Dawes has now been reinstalled on my trainer (an Elite Crono Elastogel – here is my review) and I’m one step closer to a semi-permanent indoor cycling set up (with the Trek being only for outdoor duties). Which is good. Because despite the fact that summer is coming, the arrival of said mewling infant, along with my continuing domestique duties for the first two juniors on the team roster, means that riding time really is going to be at a premium in 2016. 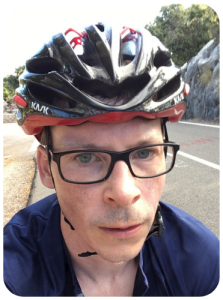 So the email from TrainerRoad in late 2014 was to offer me a free trial (apparently they’d found me through this post: my ‘ultimate’ guide to turbo trainers). And I’ve only now just got round to signing up for it. I won’t bore you with excuses. I will bore you with a disclaimer though: they’re giving me 3 months for free (presumably in recognition of my status as a pre-eminent cyclo-blogger). So I am officially biased and you can’t believe a word I say. 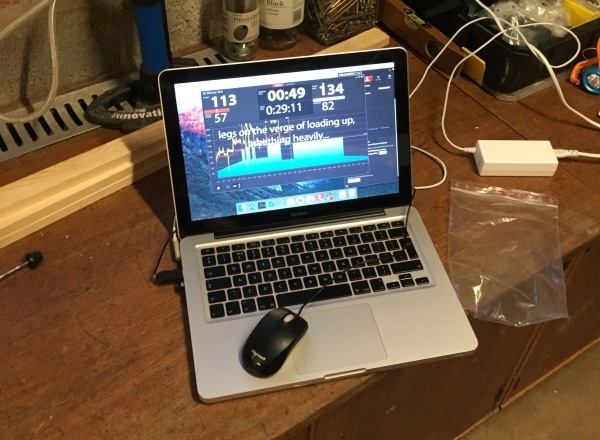 So far I’ve only done two sessions with TrainerRoad: a spin to see how easy it was to set up (and as an excuse to watch the Tour of Flanders in peace in the garage) and the “20-minute” test to find out my Functional Threshold Power (which really took an hour). I thought I’d publish this introductory post whilst some of the set up logistics were fresh in my mind. I’ll deal with more of the ‘Training-y’ aspects in future posts. How Does TrainerRoad Connect With Your Trainer? Strictly it doesn’t (in my case, as the owner of a non-smart indoor trainer). 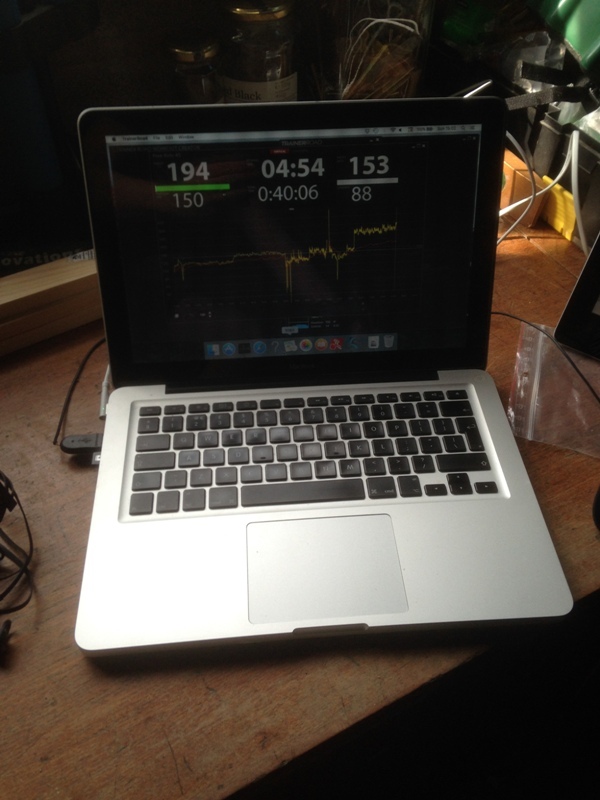 It receives data from my Garmin speed and cadence sensor, transmitted over ANT+. So first I had to buy an ANT+ USB stick for my computer (our laptop is a Mac but it’s the same if you’re using a PC). Once plugged in (to a USB port, natch), the TrainerRoad software recognised it immediately. As soon as I turned the pedal on my bike, waking up the speed/cadence sensor, the two lovers didst connect in the most pleasing fashion. And it was as easy as that. Not the clearest of photos. The top left figure is the current estimated power I’m generating (194W); 153 in the top right is my heart rate; 88 in the bottom left if my cadence. Interval time left and total time are both shown in the middle. (I say that. It was so easy, in fact, that I inadvertently connected my Trek as I wheeled it over to the other side of the garage, before even touching the Dawes. When I realised, it was simply a case of telling it to drop the Trek sensor, then search for a new one with the Dawes sensor woken up). It also connected (automatically I think) to my heart rate strap (another Garmin fandango). Again via ANT+ (as most heart rate straps are). Again very easy. For ride two (the power test), there was a little more messing around. Neither the speed/cadence sensor nor the heart rate were immediately recognised by TrainerRoad on my computer. A couple of minutes spent fiddling (essentially, taking the USB dongle in and out; ‘forgetting’ and then searching again for the sensors) got things working again. Do I Need To Be Connected To The Internet Whilst Using TrainerRoad? One of the reasons for delaying signing up to TrainerRoad is that I assumed an internet connection was required whilst using it. Despite my wifi ‘extender’, signal in my garage can be patchy. It turns out that I needn’t have worried. You don’t need an internet connection whilst using TrainerRoad (and if I’d looked at the FAQs on the company website, I’d have seen this was the answer to question 1…). The workouts are saved to your computer. 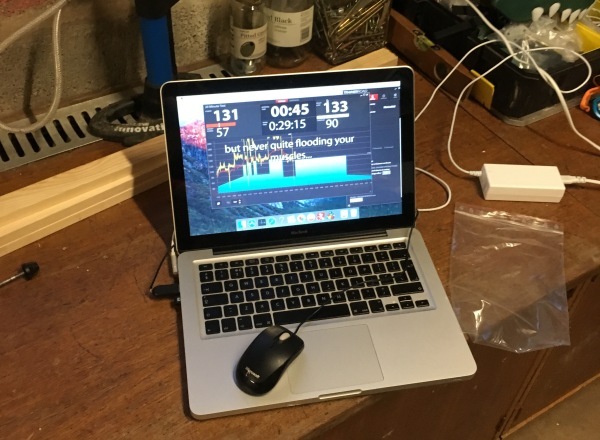 When you do return to civilisation a wifi connection, the software syncs your activity with the website. 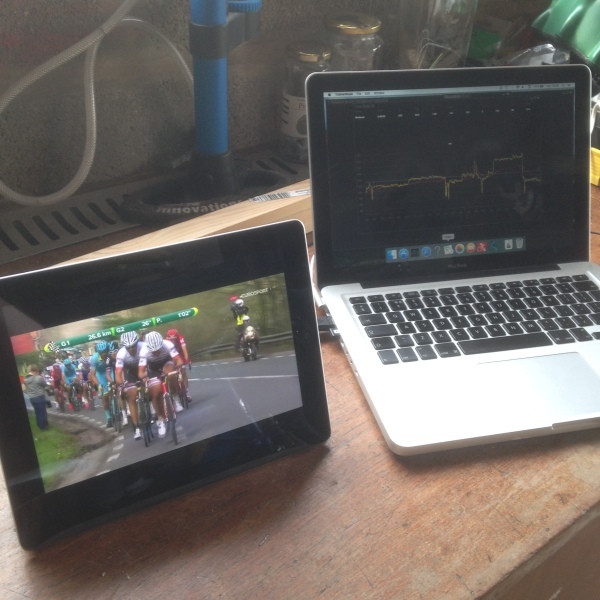 You do need the internet if you plan to watch streamed coverage of the Ronde Van Vlaanderen using the Eurosport iPad app though. Is The Power Number Accurate? Now, without being a physicist, I’m guessing that the power numbers that TrainerRoad calculates would differ from a device that directly measures power (i.e. a strain gauge attached to the cranks or in the pedals). Ignoring the potential variances between different trainers, even if they’re the same model, presumably trainer resistance levels change over time with wear (?). More significantly, differing tyre pressures will impact reported speed numbers on a trainer (increase the pressure and higher speeds become noticeably easier). All of which I don’t give a fug about. The power numbers shown looked about right to me (he says…). If it does ‘measure low’ (as some on the interwebs seem to suggest), I am fortunate in not having a fragile ego linked irrevocably to my wattage. Ultimately, I’ll use TrainerRoad over time with the aim of getting fitter. I only need to calibrate it to me at the start. The training sessions I do will be based on the numbers TrainerRoad is showing. And since I don’t have a ‘proper’ power meter (did I mention that..?) for outside riding, I don’t need to worry about making comparisons between the two. Well my first impressions are positive. The allure of ‘power’ (that mythical beast) is such that even an estimated number, fluctuating on the screen as my effort level increases and decreases, is enough to get me excited. I’ve completed my first FTP test and now I have some sort of number to structure a training programme around. I’m guessing that with my modest fitness levels, the mere act of making my training even slightly structured will be sufficient to see performance gains. 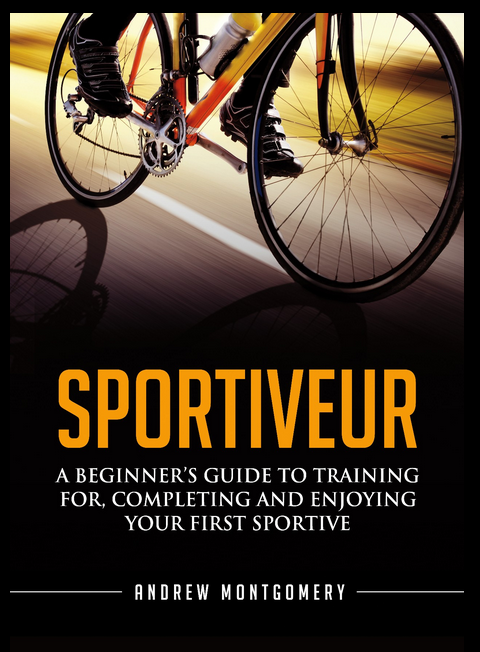 I expect that a key benefit of using a tool like TrainerRoad will be in terms of motivation, both in terms of doing the session on the trainer in the first place and, once riding, to make the session as useful as possible. This is hardly scientific, but I note that both sessions so far (a 45 minute ‘free ride’ and a 1 hour ride that included the 20 minute FTP test) have been longer than any of the trainer sessions I did as part of my 35 days of cycling challenge at the start of the year (which were more like 25-35 minutes in duration). I’m sure I’ll be writing more about TrainerRoad in future posts (you lucky readers you…). I’m sure there must be readers out there who are already using the TrainerRoad system. Let us know in the comments how you’re getting on. Do you have any tips to share with me and others, which will help us get the most out of our TrainerRoad sessions? Hi Monty, now that you’ve got a PC with an internet connection set up near your turbo, it might also be worth trying Zwift. I’m not suggesting it as a replacement for TrainerRoad but more as a complement to it. In addition to formal training you can take part in group rides and races, or just ride with friends who are online at the same time. I’ve found it great fun since I started with it January. Thanks Ross. Zwift is very much on my list of things to try. My brother in law recommended it too. Then I’ll have to think about upgrading to a smart trainer… And then a proper power meter of course…! Hi Monty, I enjoyed reading your review. I’ve been using TrainerRoad for a couple of years now and find it really works as a motivational tool for the turbo. 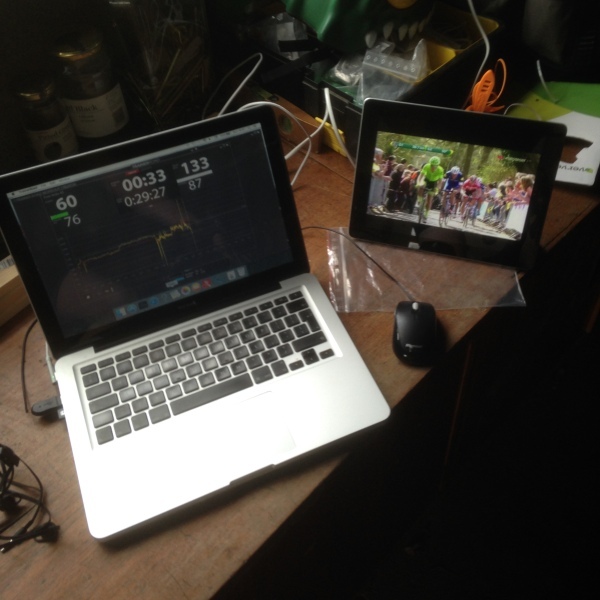 Plus, being able to do regular FTP tests means you can monitor your progress too. The structured training plans are good in helping with the discipline of working to a plan. In terms of tips for using it – did you know you can watch a video on your laptop at the same time as using the software? At the top of the window there’s a vertical/horizontal option tab. Select horizontal and it shrinks the window to a strip along the bottom of your screen, which stays on top, and any video you play fills the remainder of the screen. Also, have you tried the Sufferfest videos? These all have a corresponding workout in TrainerRoad. Unlike playing an ordinary video in the background, with a Sufferfest, you open the TrainerRoad app, select the workout, then drag and drop the video file into the workout screen. The video is then synchronised to the TrainerRoad workout. It works very well. You can also connect TrainerRoad to Strava, so as soon as you finish a workout, TrainerRoad syncs the workout not only to your TrainerRoad career but straight to Strava as well. quite a bit this winter. While I did find it useful, it was more the Wahoo that made the difference. Lately, I’ve been doing intervals with my Garmin 520 telling me the power figures. I think it’s given me a more realistic road feel than Trainer Road. Again, the Wahoo has been the game changer for me. (And essential. I live in Ontario, Canada. Even this week, it’s been -10C with snow and freezing rain. I haven’t been on the road since October. Once you start, you can feel free using different VP curves and fin out which one fits you better. There is a nice application (Fit File Repair Tool), that allows you to convert a .fit file into a XLS file to find out how the VP algorithm works… FitRepair (by Mathias Krallmann), is not free but it is GREAT to fiddle with .fit, .tcx files, etc. at least for the “number-crunching-engineering-training-oriented-data-obsessed-lot”, i.e. myself!